Shaheen is the heart and soul of HPS. It was first published as The Eagle and has since then become an annual magazine, and a hallmark of the School. Shaheen showcases the various events of the calendar year, but more than that it is a treasury of memories from the year gone by, and a vivid 200 pages of merriment, triumph and milestones. Under the guidance of Teacher Editors, a small team of dedicated Student Editors work through the year and act as the driving force behind the publication. Shaheen is a genuine attempt to perpetuate joy that drives away despair, dwells on achievement, and recaps a momentous journey. 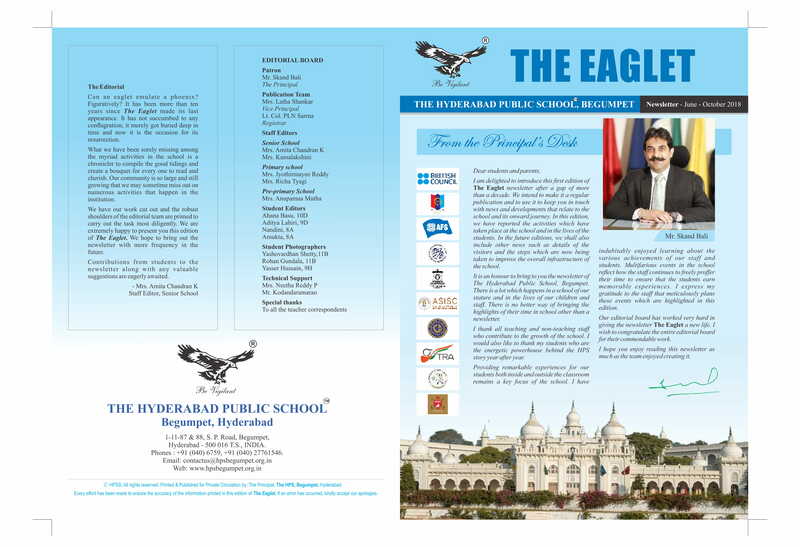 The Hyderabad Public School, Begumpet publishes its yearbook ‘Rebus’ which is a publication that reflects the events and lives of the outgoing class of 12 students involved with the school activities during their last year at school. Our yearbook is a little more than a picture book; it includes literary works and art, reflecting not only the design and photographic capabilities of our students, but also includes coverage that showcases everything from reporting of events to first-person profiles. One can consider ‘Rebus’ as a memory book, a record book, and/or a reference book. It has always been our endeavor to present facts which are honest, thorough and accurate. Students choose to cover/write on the topics relevant in student life without feeling an obligation to cover every aspect of their lives. While not every event can be covered, the major ones are. Every student from class 12 is pictured/covered at least once. Coverage includes more than photographs and captions. Coverage includes interviewing, reporting and writing about the school events, meetings or games. Great coverage is what allows ‘Rebus’ to truly serve as a memory book. Yearbook allows students to learn to write for an audience, showcase their great photography skills, learn to work well with others, learn to celebrate friends’ achievements, learn to work within a timeline and learn to be thorough and accurate. Every ‘Eagle’ is very proud to take home their Year book as a parting gift from school on the Graduation Day. They love to keep it and cherish the beautiful moments spent in school and having garnered everlasting memories with their teachers and friends. The Eaglet is a news digest focusing and encapsulating the events of a quarter. Touching up on all the significant events in the school, the chronicle is replete with images meant to connect the students and parents with the multifarious dimensions of HPSB beyond the academic rigor.